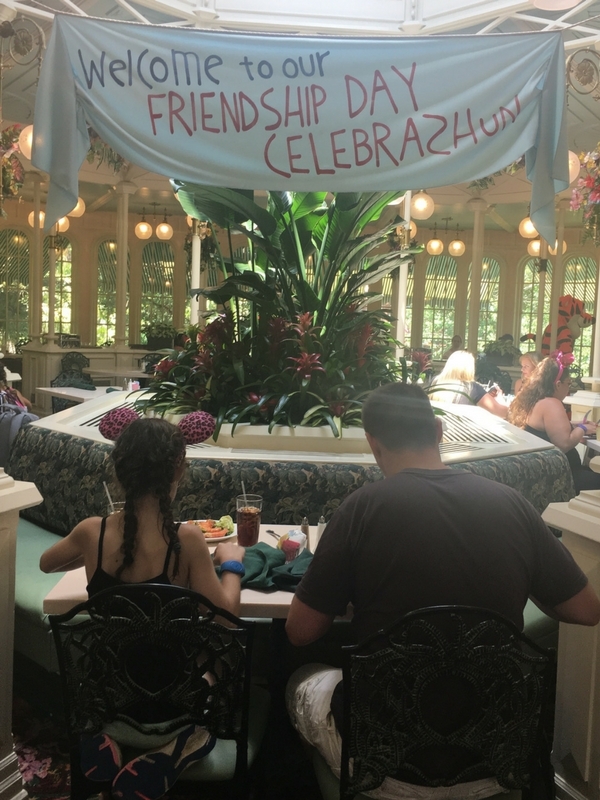 We’ve always walked past Crystal Palace restaurant in Magic Kingdom, but never really thought about booking a meal there. 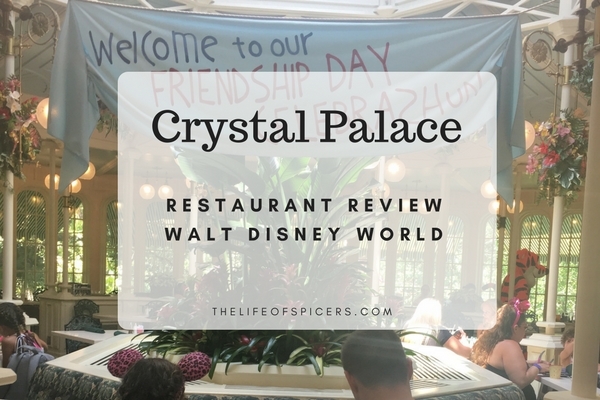 When we booked our third trip for the month or August, I decided to book lunch at Crystal Palace on our first day as it would be a good way to meet some characters, break up the day and escape the heat during the hottest part of the day. I have heard very mixed reviews on the meals in the Crystal Palace restaurant. Being a buffet, I decided that there would be enough choice for everyone to enjoy something. We booked for a 1.10pm lunch reservation, and decided to arrive at the check in desk at around 12.45pm. We were hot and having spent a busy morning in Magic Kingdom, we were ready for a rest. The check in area was REALLY busy and we couldn’t find anywhere to sit down, but we did at least manage to stand in a shady area. 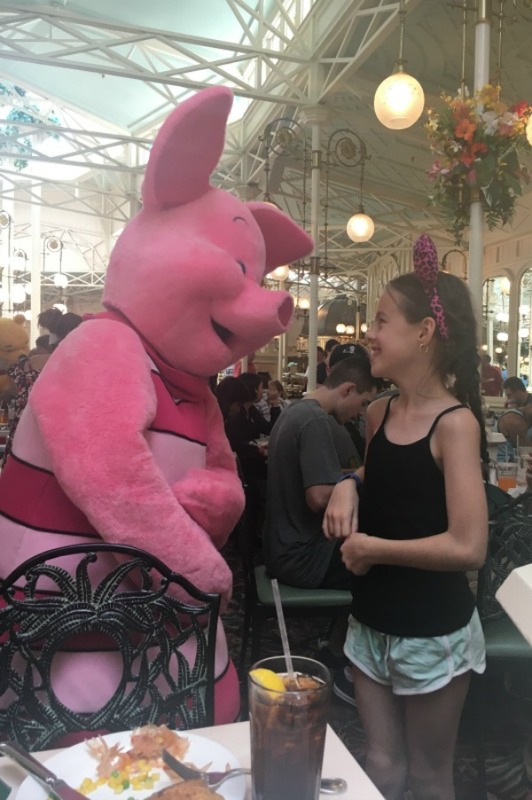 It wasn’t long before we were called for our table which was lovely and on our way to the table we were told which way the characters rotate, and that it could take up to an hour and a half. It was nice to know we wouldn’t be rushed through our meal. The Crystal Palace character restaurant is big, light and airy with plenty of air conditioning which was a welcome relief. I thought we had a great spot, close to the buffet and we could see a lot of the restaurant. With our drinks ordered, we set off for the buffet for our first selection. I thought there was some lovely choices and plenty that we all enjoyed. 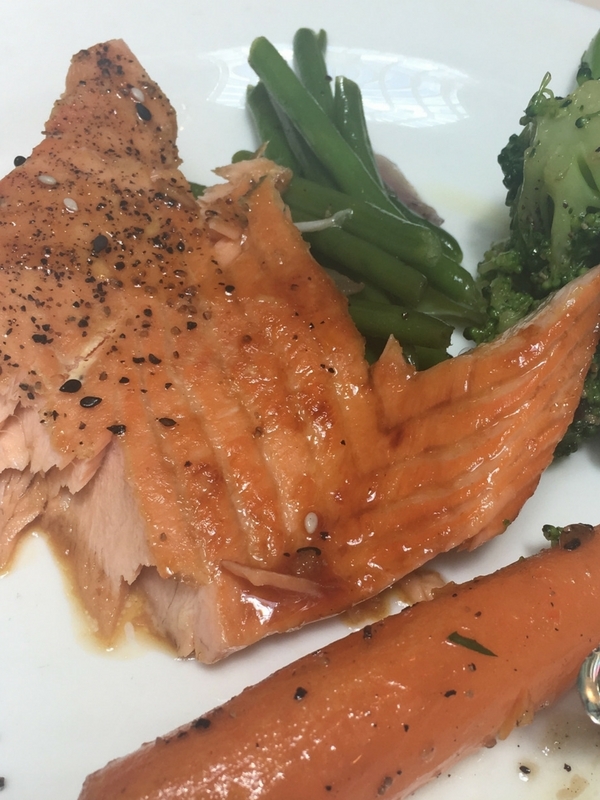 Abby particularly enjoyed the shrimp, and one of my favourites was the honey salmon, it was to die for. It was lovely to see a good selection of vegetables as well. 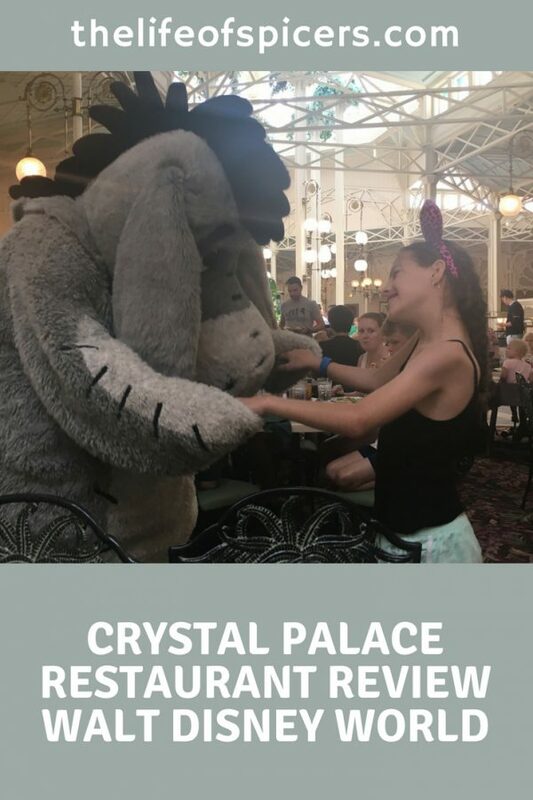 The characters in the Crystal Palace restaurant are Winnie the Pooh, Eeyore, Tigger and Piglet. We had some fantastic interaction from the characters and it turned out to be an amazing start to the holiday. Our server was very attentive with fresh drinks arriving on the table before the previous one had been finished. I always find that after a couple of plates of food, I am getting full, which is what any buffet restaurant will want to happen really to keep costs down. The desserts on offer were mini selections, which were great fun and lots to try. I couldn’t try them all but gave it a good go. I did miss the soft serve ice cream machine, but Hubby spotted it. 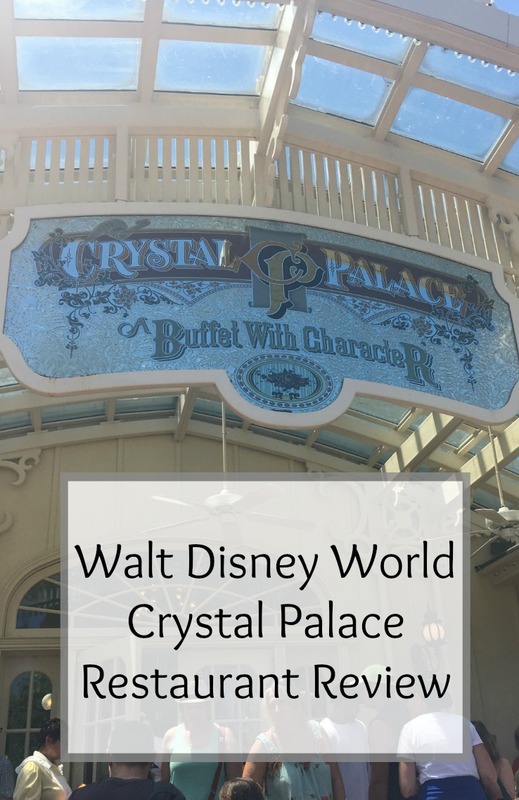 The Crystal Palace restaurant is quite an expensive buffet meal for what you get, but there is great interaction from characters and the buffet selection is good and varied, something we didn’t see at all the buffet restaurants we tried. We have also enjoyed eating at Cinderella’s Royal Table, and Be Our Guest Restaurant in Magic Kingdom.